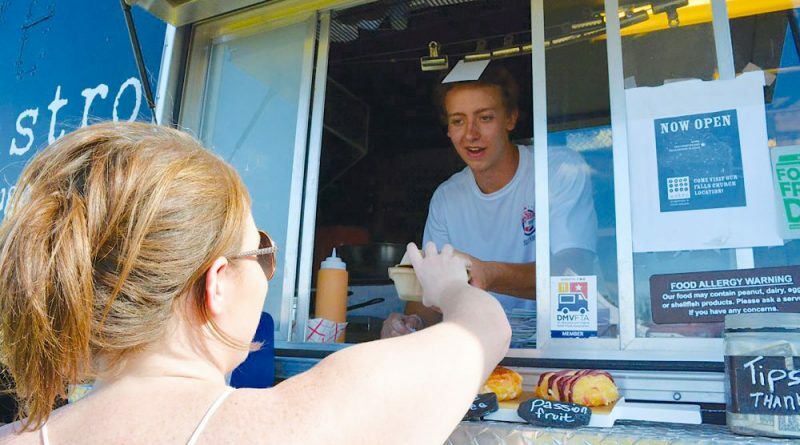 After months of debate, proposed zoning rules that would allow food trucks to operate in downtown Leesburg and downtown restaurants to extend their outdoor dining options with tents and shade structures have cleared Planning Commission review. New policies now go to the Town Council for public hearings and final action. The proposals to permit food trucks to operate on private property outside the core blocks of the historic districts and for restaurants to erect tents to cover some outdoor seating continue to be controversial. They passed the commission on 4-2 votes May 10. 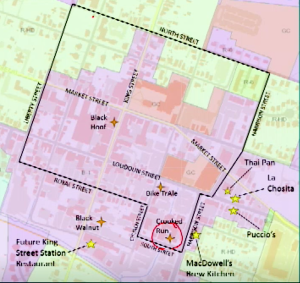 Disagreement remains on whether the uses should be allowed at all downtown and, if so, whether the proposed rules would adequately protect the historic district. Commission Chairwoman Sharon Babbin pushed through final versions of both policies, describing them as compromises aimed at meeting the needs of downtown businesses. She was supported by Vice Chairman Rick Lanham, David Faliskie and JoAnn Walker. Doris Kidder and Gigi Robinson voted against both proposed zoning code changes, citing concerns about protecting the historic district and adequately controlling the uses. Ad Barnes was absent from the meeting. Under the food truck proposal, mobile food units would be permitted to operate on private property in the downtown B-1 zoning district outside a proposed exclusion zone—bounded by North Street, Harrison Street, Royal Street and Liberty Street and including the Market Station complex. Under the food truck proposal, mobile food units would be permitted to operate on private property in the downtown B-1 zoning district outside a proposed exclusion zone—bounded by North Street, Harrison Street, Royal Street and Liberty Street and including the Market Station complex. That designation would permit food truck operations at Loudoun Brewing Company and Black Walnut Brewing—two businesses that hosted food trucks for their patrons on weekends until the town began enforcing the zoning code—among other businesses outside the exclusion zone that have available space on private property. The town attorney’s office warned against using the exclusion zone. Deputy Town Attorney Shelby Caputo said it would likely not meet the required test of treating similarly situated properties in similar ways. Of particular concern was that the district was created with the “expressed purpose of protecting brick-and-mortar restaurants from being impacted adversely by mobile food units,” according to the staff report. However, Babbin said the purpose should be viewed as to protect “the appearance” of the core historic district by keeping food trucks out. But even that drew concerns from the legal department. Kidder and Robinson opposed allowing food trucks downtown and the commission voted, also 4-2, to recommend the council not move forward with the changes if the exclusion zone isn’t implemented. The commission also was split over proposed regulations to permit tents and shade structures as temporary uses in the rear yards of downtown restaurants. The proposed regulations limit the size and location of the coverings and would allow the structures to be put up without oversight by the Board of Architectural Review. Again, Kidder and Robinson opposed the changes, especially the decision to not require BAR review. “We have taken a giant step backwards in protecting the historic fabric of downtown Leesburg,” Kidder said.